Our next Wellness Day is on Saturday, October 25th, from 10 a.m. – 5 p.m. A benefit BBQ for The Xena Project will be held from 11 a.m. – 2 p.m. Plates are $10, and all proceeds go directly to veterans. Learn more about The Xena Project, here. Also in attendance: representatives of the Military Order of the Purple Heart, Katy Chapter, and Lonestar Veterans. 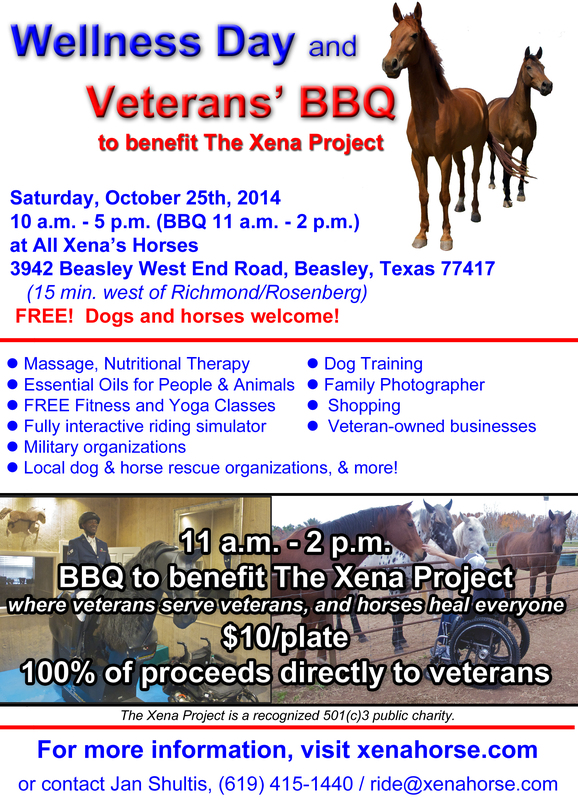 11 a.m. – 2 p.m. – Benefit BBQ for The Xena Project! Keep scrolling for a flyer you can share with family and friends, and driving directions. Whether you come out for the fair or the food, we look forward to seeing you and your animals! Thank you to the Fort Bend Herald for sharing news of this event on the front page of the Sunday paper, October 19th, 2014. Click here to download Wellness Day flyer (pdf). Thank you to the approximately 150 attendees and dozen exhibitors who attended our first Wellness Day, June 29th. We were thrilled to see you! Please click here for photos of the event, and scroll down for more information from that day.